Today is my first day of eating a bit healthier so I spent some time today doing a little prep work. My biggest downfall when it comes to eating right seems to be lunch. And by “lunch,” I actually mean that wonderful window of time between about 10 a.m. and 3 p.m. when I seem to graze constantly. My 5-year-old and I usually have lunch together, and we’re both pretty bad when it comes to eating a real meal. Nothing sounds good. It’s too much trouble to make anything. So, we go from crackers to popcorn to apples with peanut butter. I usually end up making her a sandwich or something kid friendly, but I don’t bother to make anything for myself. Finally, I’m so hungry that I resort to what comes easy — cookies, candy or something else full of sugar! Or even worse than that, she asks me in her sweet little voice, “Mama, can we go to Chick Fil-A?” and at that point, I’m not just hungry, I’m hANGRY so I instantly agree. 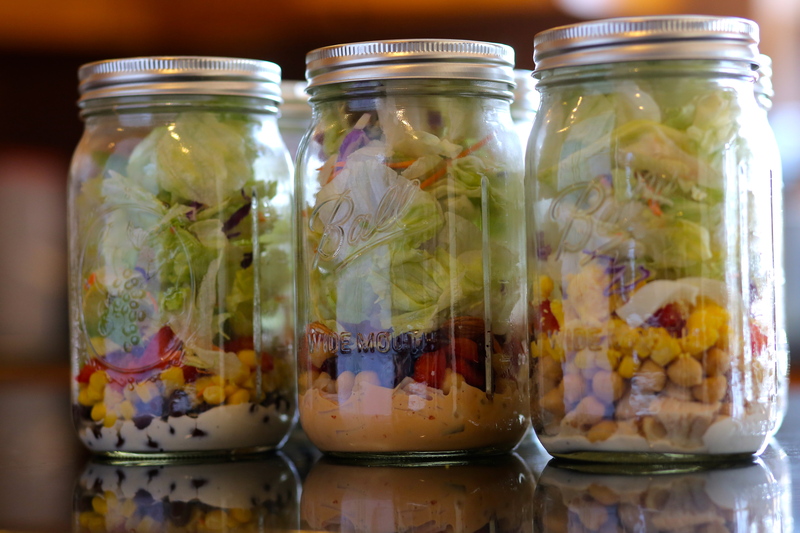 I had seen this idea many times on the Internet to make salads for an entire week in mason jars. It always looked like a great idea, but I don’t normally have all of the ingredients in my fridge at one time that I would need to make a variety of salads. Today, I just decided to make it happen. We went to Costco and stocked up on all of the necessary supplies to make some yummy salads for the coming week. 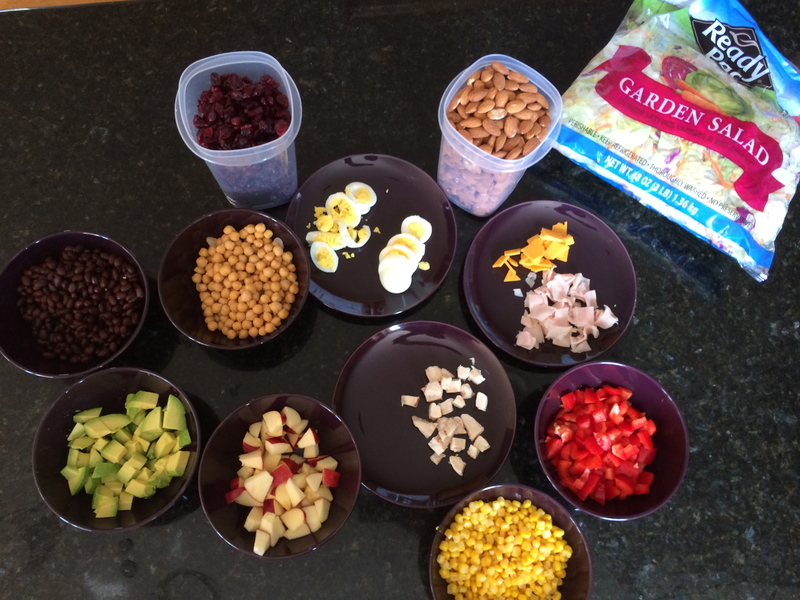 I realize there are much, much, much healthier ways of making salads than the ingredients I chose. But you have to remember that when I say I’m eating “a bit healthier,” my standard is a Snickers bar, a huge bowl of popcorn, some chocolate cake or on a really bad day, a Big Mac! Then, I just filled my mason jars with various combinations. I read lots of Pinterest posts that said as long as you put the dressing on the bottom and the lettuce at the top, your salad should stay fresh for about a week or more in the fridge. I made seven salads so I could use up most of my ingredients, and I have to say that I can hardly wait to eat lunch tomorrow! Has anyone ever tried this? What other ideas do you have to eat a healthy lunch? I would love to hear! I *love* your ingredient choices!!! (Minus the red pepper for me ;-)) How are they holding up in the fridge?? ?